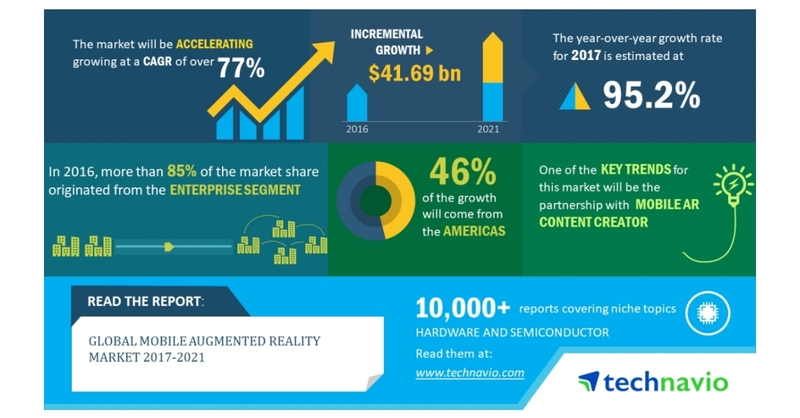 LONDON–(BUSINESS WIRE)–According to the global mobile augmented reality market research report released by Technavio, the market is expected to accelerate at a CAGR of more than 77% during the forecast period. The adoption of crowdfunding strategy is one of the key market drivers. This research report titled ‘Global Mobile Augmented Reality Market 2017-2021’ provides an in-depth analysis of the market in terms of revenue and emerging market trends. It also includes an up-to-date analysis and forecasts for various market segments and all geographical regions. In 2016, the marketing and advertising segment accounted for over 43% of the mobile augmented reality market share and is projected to contribute to over 45% share by 2021, exhibiting almost 2% increase in market share. The partnership with mobile AR content creator is an emerging market trend. The mobile devices have created more opportunities for vendors to innovate and enhance real-world experience owing to technological advances. One such innovation is the AR that creates a digital layer of the physical world, providing the consumers with a more immersive experience. To boost the development of AR technology, the vendors of AR technology are creating mobile apps by collaborating with other vendors.